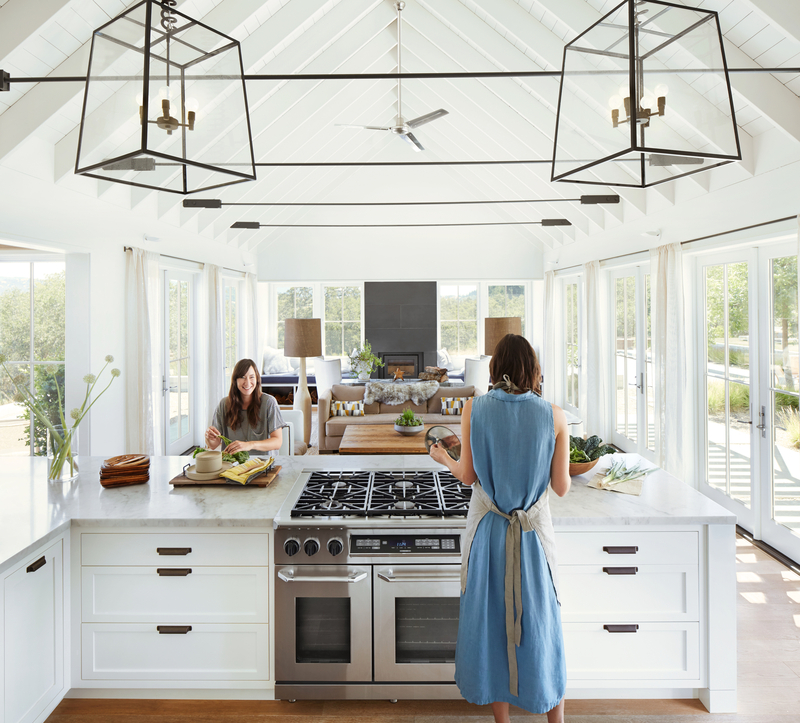 Bigger isn’t always better, for some families living in a large home is great but for others the cost and energy required to maintain them is difficult. A smaller home on a more affordable block can offer the same lifestyle quality as a big home. A lot of singles, couples and young families now embrace “town house living” even though a house on a big block was once the dream. You can’t build McMansions in nooks and crannies, we have to build smarter, tighter, leaner and more fitter houses to have a better mortgage verse living life balance. Every block has its challenges, why not embrace them and use them to create character in a home. Having a smaller home allows people to save money on land and have the option of investing in the home or maybe the holiday they have always wanted. Having a small home can result in big savings with construction and furnishings and also make a home feel cosier and create a genuine lived in feel. Cleaning and de-cluttering takes half the time, allowing you to have more time to do the things you love. Larger homes are great, but sometimes create distance in families as each person has one or more places where they can remove themselves from everyone else. Small homes bring back old family values. Having a living room for the family to cook, eat, share their day and actually be lived in and having bedrooms for privacy and peaceful long night sleeps. Studies show; families that live in a small home spend more time together and have more regular family outings. Whether you are a family of 3 or have many fur babies these activities create a strong bond in a family structure. Statistics show that 22.5 % of people in older households without children wanted to downsize to smaller homes. These older age groups moving house is often associated with 'empty nesters' downsizing or moving into more suitable accommodation for health or age reasons. Of people in older households who had moved in the last five years, almost a quarter (23%) mentioned wanting a smaller home or to downsize as a reason for their latest move. Downsizing to a smaller property might not sound like the most glamorous change to your life, but remember.. Downsizing does not mean downgrading! Downsizing is the perfect option for the people who have already lived the dream of the life on a big block. Downsizing to a 3 bedroom home to escape the life of maintenance you have lived for so long. Downsizing can bring back the old school values of having a living room for the family to cook, eat, share their day and actually be lived in and having bedrooms for privacy and peaceful long night sleeps. Gone are your full Saturdays of mowing lawns and overflowing green waste bins. Living on a small block allows enough creative space in the garden to design something truly amazing with low demand in maintenance. There is less expense in overheads such as watering, weed control and Kerb Side Appeal. Thus, freeing up your time to do the things you truly love. In small houses vertical storage is a great way to go. It's important not only to keep your belongings out of the way, but it also sends the eye upwards creating a sense of space. 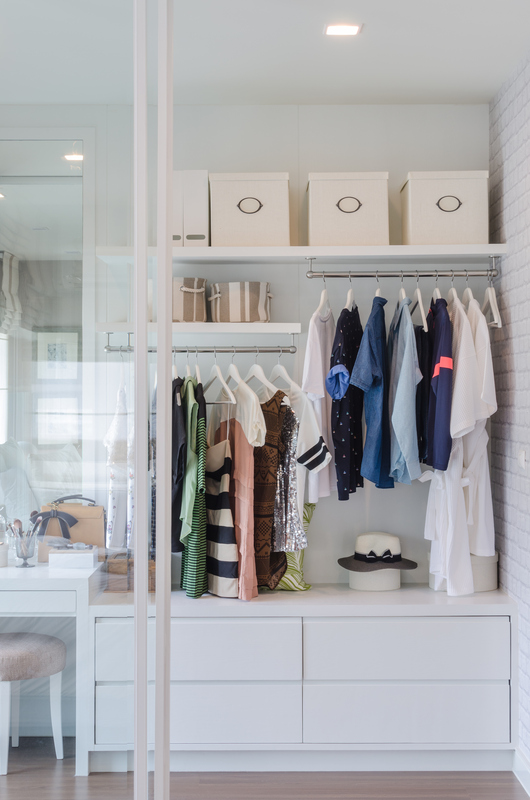 Utilising vertical space can be done by extending the height of kitchen cupboards, wardrobes and linens. Also being creative with the storage areas, making every space count. 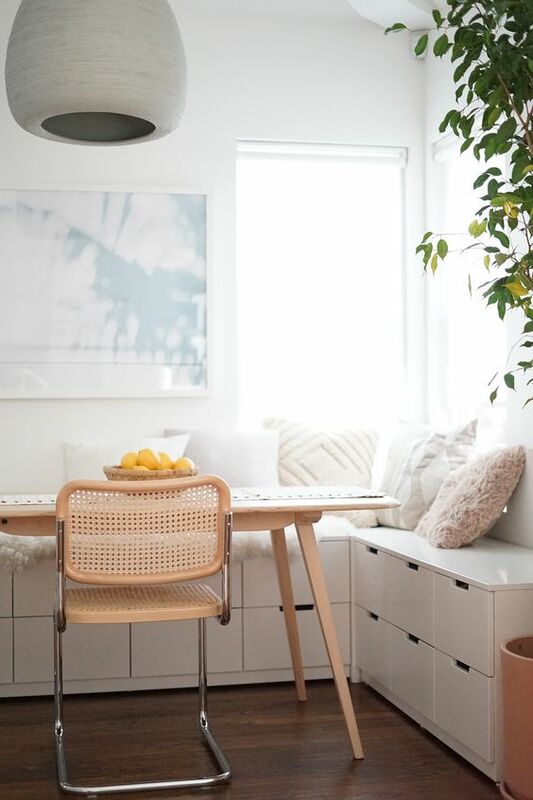 Having bench seats at the dining table and use the space underneath as storage. Built in cabinetry around the TV and even storage in furniture such as ottomans and beds. Tiny homes are the new alternate lifestyle dream, originally from the United State, tiny homes are fast attracting people here in Australia. The typical American home is around 245 m2, whereas the typical small or tiny house definition is a home with square footage is between 9m and 37 m2. People attracted to tiny houses tend to build or purchase them because they're cheaper than standard houses, leave less of an environmental footprint and allow their owners to have more time and freedom to do other things besides home maintenance. This is one of the reasons why a lot of elements of a tiny home design can be incorporated into a custom home on a small block. They include everything you need such as a bathroom, living space, kitchen and bedroom all in a scaled down, petite space. It is a movement that focuses on a simpler way of living rather than on the things we own. The tiny life provides huge financial advantages and the ability to live a lifestyle filled with adventure. 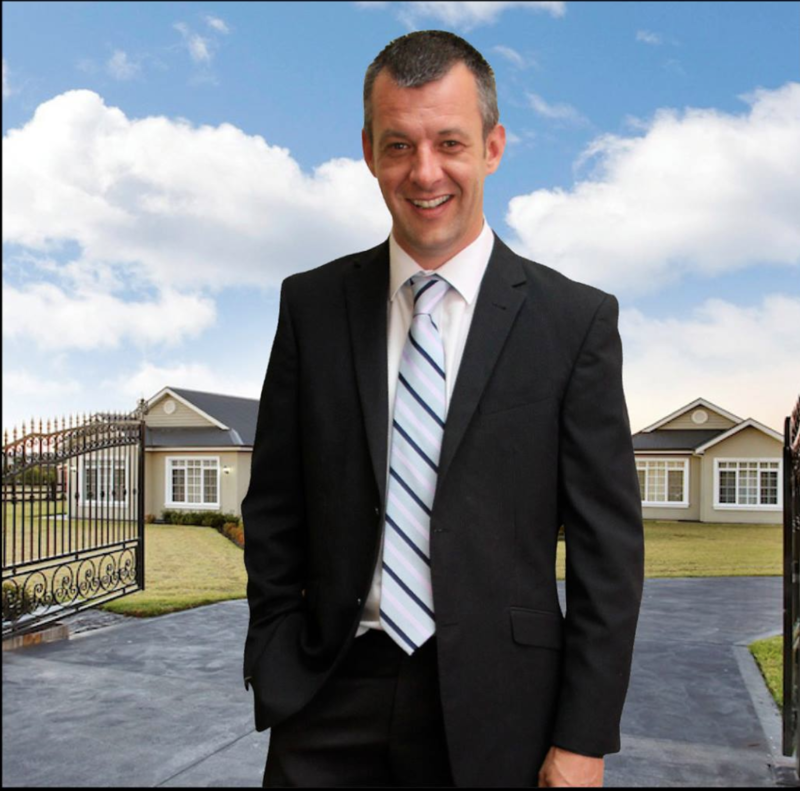 We caught up with Wayne Eagles from My Property Consultants about value in a small block and 3 bedder homes vs 4 bedders. See our Interview below. What is considered value in a small block when selling it? 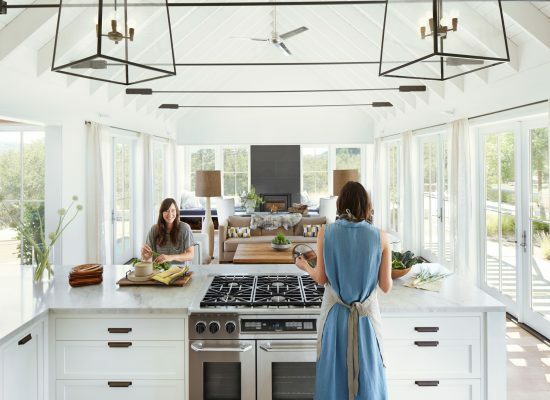 "Home owners are beginning to swing away from the maintenance of larger blocks with a trend toward unit living or homes on smaller blocks as evidenced by many new releases." What is better, 3 bedroom or 4 bedroom homes? What are the pros and cons when selling a small home? "New releases are flooded with 4/2/2 properties with a lot being purchased as investments as advised by accountants for depreciation purposes. These properties represent the great depreciation benefits but are likely to underperform in the broader market simply due to supply and demand factors. A smaller, higher quality home hits many points in the market including first home buyers, retirees, divorcees and investors with a reduced price point." 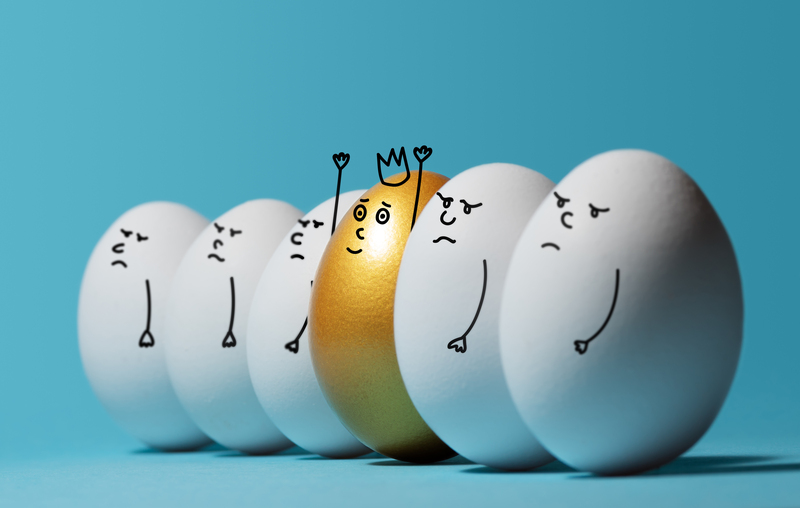 Do you believe custom design can separate you from the crowd? 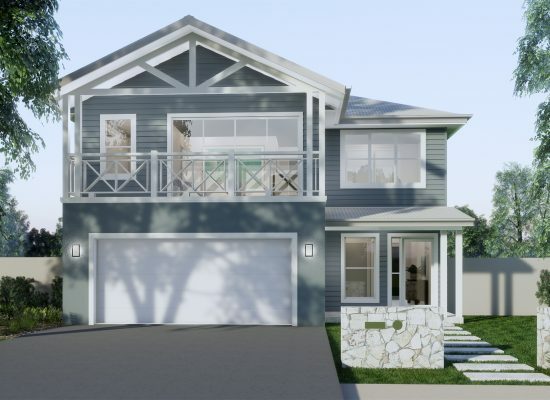 "A fresh, high quality, well designed custom home with high end inclusions is definitely a point of difference which will assist the owner in separating themselves from much of the stock on the market"
What do you think about lifestyle building? "Lifestyle building is wonderful for the initial occupant for which the property is initially designed and also offers another point of difference at point of sale which would help separate you from the crowd when there is a lot of stock on the market….it is amazing how a fresh idea and how we live the way we live will in turn suit another party at a similar stage of life." There are so many elements to designing a home and we don’t believe that one size fits all. The flexibility of custom design allows you to get the full potential out of a block of land and the home on it. It also can help in running costs and longevity of the home. For example, strategically putting windows in areas to create cross breeze and better ventilation will lower heating/cooling costs and damp areas in medium density living. Together with Architecture Republic, we have come up with 3 options to suit a number of different lifestyles. Together with architecture republic we came up with 3 different designs to suit a block based on a few key features; 9m frontage, front door facing north and having a court yard instead of a back yard allowing better access to natural light and a view of open space instead of a fence. 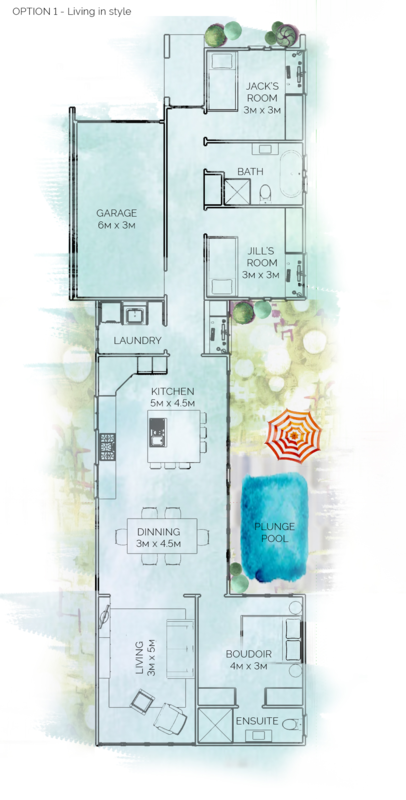 There are so many elements to designing a home and we don’t believe that one size fits all. The flexibility of custom design allows you to get the full potential out of a block of land and the home on it. It also can help in running costs and longevity of the home. For example, strategically putting windows in areas to create cross breeze and better ventilation will lower heating/cooling costs and damp areas in medium density living. We have come up with 3 options to suit a number of different lifestyles with and they provided us with 3 options of floor plans for small blocks and they gave us some notes for each plan. Living in style house plan (option 1) – This was the first concept created for this brief, it has easy access and ticks all the basic boxes; kitchen, living and dining, 3 bedrooms with 2 bathrooms and a separate laundry. The biggest discussion point for this design was the main bedroom is accessed from a main living area and not a hallway. Traditionally any bedroom should be accessed from a hallway to allow privacy in every day to day living but for some this design defect is an asset, some love the feeling of always being connected to the movement of the house and prefer the open-door concept of the design. This could also meet the liveable housing guidelines set in place by a national body, The Liveable Housing Guidelines which have been developed by industry and the community provide assurance that a home is easier to access, navigate and live in, as well more cost effective to adapt when life’s circumstances change. 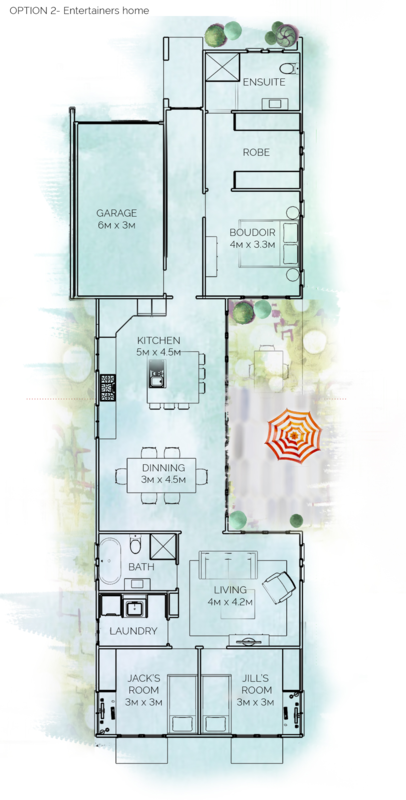 Entertainers house plan (option 2) - Master suite is at the front of the building with both Jack and Jill bedrooms having access to the backyard and windows on two sides. The master bedroom has its own access onto the courtyard, which is a really important part of what makes this design work. Nice and Cosy house plan (option 3) – If privacy is an issue and you prefer to access any bedroom from a hallway this is the plan for you. The dining room is sacrificed so that the master suite is accessed via a hallway, and there is an extra storage area. The master bedroom gets a walk-through robe, there is also room in the bedroom for more robes if needed. This arrangement means the living areas still have access through to the backyard though, and the laundry is closer to the yard. We showed these plans to a number of people ranging from 21 years old to 67 years old, males. Females and couples. There was always a number of things each and every person considered changing if it were their home. Each block has its own unique qualities and embracing the challenges a block may be the best decision you’ve ever make. When looking at blocks of land don’t shy away from the small house movement. 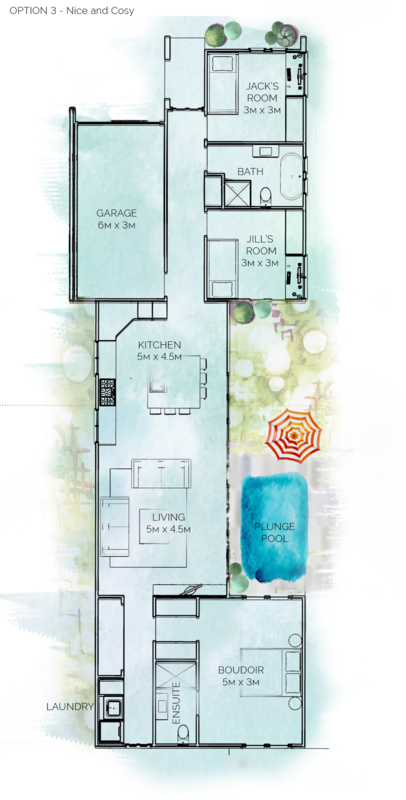 The plans here are just some ides to customise your lifestyle with a custom-built home. - The house is designed around a courtyard rather than a backyard, which gives every bedroom and living area an outlook (instead of just looking at a Colorbond fence 900mm from the window). - Living areas have about 9m of opening to the yard (which wouldn’t be impossible if they opened onto a backyard on a 9m block. - Locating the living areas in the centre of the house means there are no long hallways. The hallway at the front is only the length of the garage. - Garage is 3×6m. If you're not driving a Pajero, that gives you a fair bit of space at the back of the garage for some shelving and storage. - Bedrooms neatly fit a single bed, wardrobe and desk. - In options 1 and 2 there are separate laundries with some room for linen space, as well as a linen cupboard in the hall. In option 3 the laundry is sacrificed to add a hall and a more private entrance to the master bedroom. - The design suits north being front, back, or courtyard side. If north were the other direction, the house could mirror to suit. - There is room behind the kitchen for streamline water tanks. - Access to courtyard and backyard down the left-hand side of the property. - In all options there is separation between parents' bedroom and living areas on the one hand, and the children's bedrooms on the other. This creates a bit of soundproofing to suit watching late night movies etc! - In option 1 - There is a study nook next to the kitchen that has outlook into the garden. This could be sacrificed with the laundry to make the living areas larger. - The hallway has been designed wider than the bare minimum, to avoid the house feeling too poky and providing versatility with a good first impression. - Ceiling over dining and kitchen is pitched to match the roofline and flat elsewhere (though the lounge room in option 1 could pitch up skillion-style). - If the house were to be extended, we think the upper floor would sit over the front bedrooms, bathroom and hallway. The new stairway could replace the bathroom (perhaps with a powder room under) and a new bathroom upstairs or could take a bedroom (to be replaced upstairs) or could take the study nook and some of the garden. If you’re looking for more inspiration jump on our Plans page for more layouts and finishes.